The 2017 Emmy Awards were held at the Microsoft Theater tonight. Host, Steven Colbert tried hard to breath life into the ceremony and occasionally delivered. 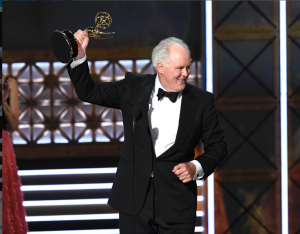 Some of the highlights included John Lithgow’s win for “The Crown,” Alex Baldwin being rewarded as Outstanding Supporting Actor in a Comedy Series and Elizabeth Moss’ expletive laced acceptance speech after winning Outstanding Lead Actress in a Drama Series. Also memorable was 92 year old Cicely Tyson’s emotional recollection of “Roots,” the groundbreaking series in which she starred some 40 years ago. One of the biggest downers was the show’s announcer, Jermaine Fowler of CBS’ “Superior Donuts” whose grating voice was hard to listen to.